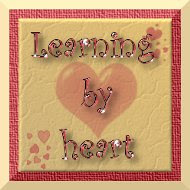 Learning by Heart – January | Tired, Need Sleep. The sweet deer that visit us weekly at our nature center. I’m not sure where the time has gone this month! We haven’t done a ton of learning activities, but we are slowly getting back into the swing of things. I’m re-thinking and re-planning some things as we go. I’ll try to just hit the highlights of this month in this post (sorry if it gets too long!). Mostly, I’ve been rotating toys on M’s shelves this month. New toys from Christmas make this easy to do for a while. I have plans to create a page where I can list all the activities I rotate on the shelves for M, because I think it’s fun to read that kind of thing, but also because I think it gets kind of tedious on these weekly posts to keep listing the same things time after time. I will, however, make sure to mention any new items that I put out for him. It is so much fun – I’m not much of a fan of traditional workbooks, but the Kumon group of books is excellent. This has been a big hit with him. There are, I think, roughly 80 mazes – great for reasoning skills and fine motor skills. The dot-to-dots each go up to 100, which is a real challenge for him right now, and we normally do those together. Since the pages are all in page protectors, he uses a dry-erase marker to do them, erases them with a piece of felt, and then does them over and over again. I think this will be a great car-trip book! Math: Not much has been done on this front, although M continues to enjoy counting anything and everything. One day he decided he wanted to count to 100 and surprised himself by actually doing it. :) He only needs a little help once in a while, and he does not recognize the written higher numbers, but wants to, so that’s what we’ll do next. Mixing colors of water in an ice cube tray. He asked to do this, which he does from time to time. It’s one of his favorite things. He likes to watch the colors mix, use the pipette, etc. Normally he then asks for these ice cubes when he’s taking a bath, and enjoys watching them melt and color the bath water. We’ve been doing one mama-led science experiment per week, and I’ll post about these at Science Sunday on Ticia’s blog – stay tuned! As you may know, M is obsessed with all things electric, especially light bulbs and batteries. He has been itching to know how these things are made, and I found a couple of interesting you tube videos about just that – How Light Bulbs are Made, and How Batteries are Made. He was fascinated by the machines that make these things and loved the videos, although I’m not sure how much he really understood (the voice over sounds like a computer voice and has what might be a British accent). I was pretty fascinated too! I printed out several sets of sequencing cards, and by looking at the cards, M was usually able to tell which poem they were for. Then we’d say it together and then he’d say it again, while setting the cards out, in order, on the appropriate square. He really enjoyed this. I’ll probably set this out on his shelf with more cards for him to do independently. Karen at Prekinders has these fantastic rhyming mats and cards, which we also did. M always enjoys doing these! Art: We’ve started going to a weekly music class – it’s very informal – lots of playing around with a great assortment and variety of instruments, some movement songs, and lots of rhythm activities. We enjoy it a lot, but I’ve noticed it’s the same activities, in the same order each week. Occasionally there’s a new song thrown into the mix, but there just isn’t enough variety to keep us interested in going each week. There are only 6 more sessions, so I think we’ll try to make it to 2 or 3 more. It could be such a wonderful program if a little more effort went into the planning. It’s just a regular drawing of him, but see the rectangle drawn around him? And how his feet aren’t touching the bottom? It’s M jumping! Hee hee, I love it. We’ve also been doing one planned art project per week. Most recently, we colored on white construction paper with crayons, then rubbed over it with mineral oil. This was an idea from one of Mary Ann Kohl’s books (can’t think of which one right now), and it was supposed to make the colors brighter. It didn’t really seem to be working, so I showed M how to make a loopy design and then color in each open area, hoping that with more color all over the paper it would work better. It worked okay, and actually the oil made the paper seem more like a thick vellum, which was pretty neat. We hung the finished artwork in the window to be a suncatcher, but unfortunately we haven’t had much sun lately. We also read The After Christmas Tree, by Linda Wagner Tyler: which talks about the tree’s “second season of giving”. Finally, I’m not sure what category this falls into, but it was fun! I filled a bowl with water, added a bunch of small objects, and let it freeze outside overnight. The next day M chiseled away at it to get all the little things out. He really enjoyed this! Hope your winter is full of coziness! I’m linking this post up to Preschool Corner, Friday Wrap Up,and Weekly Wrap-Up; be sure to check them out! Oooh...I like the chisel idea! It was good to catch up with what M has been up to - his engineering tendencies crack me up. Anna also enjoys non-fictional videos a lot and currently obsessed with Lego and all things space. I love the idea of setting the tree outside and making treats for the birds. We recently moved and this house is a little more in the "country" than where we were before. We are loving watching the birds come to our birdfeeder. What a fun week! We LOVE Kumon books here too! S is currently doing the Mazes one as well.